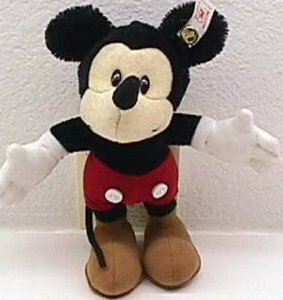 5½", 1998, First in Series to celebrate the 70th anniversary of Mickey Mouse's debut in 1928. Black mohair, cream velvet face, black velvet nose, white gloves, red velvet shorts, brown shoes, wired arms and legs so he can be posed. Black cotton cord emitting from top of head for hanging. Non jointed. Made exclusivley for Walt Disney Gallery.